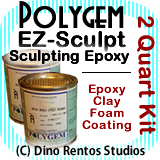 Polygem EZ Sculpt Epoxy Clay Foam Coating - 2 Quart - Dino Rentos Studios, INC. This coating will bind to the foam and gives you plenty of time to texturize the clay or smooth it out. Leaves a rock hard coating on the foam. EZ SCULPT is a 100% solids epoxy system specially formulated to a workable "clay like" consistency for sculpturing and modeling projects. EZ SCULPT will cure into an extremely strong and durable plastic that is easily sanded or shaped. EZ SCULPT can be tinted or painted and accepts stains. EZ SCULPT is used as a free-form sculpturing medium or applied as a textured veneer over other surfaces. EZ SCULPT is ideal for small or intricate detail work where strength and durability are desired. Gather equal amounts of Part A and Part B by volume. Wearing protective gloves, begin to knead the two parts together until streak free and uniform in color. Small amounts of water may be used to help prevent the EZ SCULPT from sticking to the gloves. Form or shape as desired. You can apply the clay any way you need. Sculpt it on or roll it out so its evenly thin. Since its a clay you can work the EZ SCULPT into any areas you have. Fill in cracks and Raise areas that you want. The clay can be removed from the foam while it is still workable but once cured it bonds its self to the foam. Now the fun begins! You can use a texture stamping pad or any texture making process you may have. Here I stamped the EZ SCULPT epoxy clay with a reptile skin patern. Sculpt away! Make eybrows, eyes, designs, anything you can do in clay! In 24 hours your clay will harden to a rock solid foam coating that won't come off the foam.